The Johannesburg Botanical Gardens is situated in Emmerentia in Johannesburg, South Africa. These gardens are beautifully manicured and well looked after which makes it great place to relax and enjoy the tranquillity of the natural beauty around you. The Johannesburg Botanical Gardens have a large and beautiful variety of trees and succulents to view. The gardens are popular amongst local and national visitors. There is a herb garden with a variety of different herbs from medicinal to cosmetic. It is a very interesting place to visit where you will learn a lot about each plant and its uses. The whole family will enjoy the day at the gardens, walking around, picnicking or playing on the grass with the children. There are also live music concerts held in the gardens by local artists, a great way to spend a gorgeous summers day in Johannesburg. Many brides have chosen to have these beautiful surroundings as the backdrop to her bridal photographs. What more can you say? The Johannesburg Botanical Gardens are open from sunrise to sunset, and there is safe parking from different access points in Thomas Bowler, Orange and The Braids roads. The main entrance is in Olifants Road. 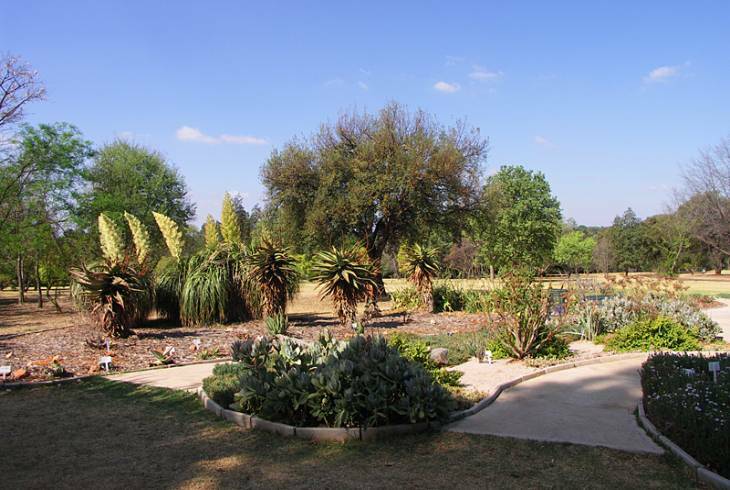 Johannesburg Botanical Gardens Information and Nearby Accommodation.